Embattled ride-hailing giant Uber Inc., which has faced criticism for its corporate culture, tendency to bulldoze over government regulations, and controversial founder and former CEO, may be turning a corner. Citing “two people familiar with the matter,” Bloomberg News reported Monday that current Expedia Inc. CEO Dara Khosrowshahi is now expected to succeed former CEO and founder Travis Kalanick, who resigned amid mounting public and investor pressure in June. 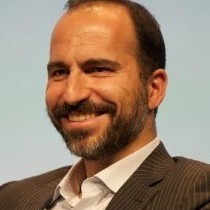 Expedia CEO Dara Khosrowshahi will reportedly serve as Uber’s new CEO. Uber’s board of directors formally made the offer on Sunday, and while at press time Khosrowshahi hadn’t publicly accepted, Bloomberg’s sources assured reporter Eric Newcomer that the deal was closed. Uber has yet to issue a statement regarding the matter from either its newsroom or its Twitter account, though if Bloomberg’s sources are to be believed the Persian-American Khosrowshahi faces both a long road ahead and is about as well-equipped to face it as any executive while also potentially putting a gentler face on Uber’s public persona than the brash Kalanick. As CEO of Expedia, a position he’s held since 2005, Khosrowshahi has helped the travel website go from $15 billion in bookings to $72 billion last year (all figures USD) – a success that made him the U.S.’s highest-paid CEO in 2015, when he earned $94.6 million. He’s also one of the technology industry’s most outspoken critics of the current U.S. administration, having railed against Donald Trump’s travel and immigration ban and mocking Trump on Twitter for repeatedly failing to “rise to the expectations of his office” after his response to protests in Charlottesville, Va. Appointing an open Trump critic to Uber’s helm could be a first step in rehabilitating the company’s image, which has taken a hit after a series of setbacks including but not limited to the viral blog post by former engineer Susan Fowler depicting a workplace culture of sexual harassment that led to the company’s present soul-searching in the first place; a viral video of Kalanick harassing an Uber driver over declining fares; the public resignation of a president appointed to change course; and even a self-released report acknowledging that so far, Uber’s efforts to diversify its 64 per cent male (and more than 50 per cent white) workforce were falling short. Meanwhile, Khosrowshahi’s most combative moment as Expedia CEO was his criticism of Google Inc.’s promotion of its travel services over Expedia’s during hearings in the search giant’s recent European Union antitrust case, which ended with a €2.4 billion fine in June. “We’re comfortably uncomfortable as it relates to Google,” he told Bloomberg in July. Khosrowshahi came to Expedia through IAC/InterActiveCorp, an American media and Internet company that now includes everything from Ask.com to Tinder, from which Expedia was spun out in 2005. Though trained as an engineer, he briefly worked in investment banking before joining IAC during the dot-com boom.